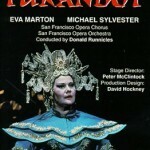 This Turandot is less lavish and more intimate than Franco Zeffirelli’s legendary Met production, but just as visually striking in its own right thanks to the memorable set designs of David Hockney. 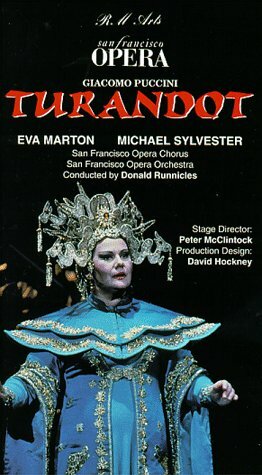 His flat, storybook-like aesthetic, with its sharp, exaggerated lines and bold solid colors (predominantly red, blue and green), combines with Ian Falconer’s colorful costumes and Thomas J. Munn’s darkly atmospheric lighting to create a deliciously exotic fairy-tale atmosphere, but one with an appropriately sinister edge. From the blood-red walls and curving green rooftops of the imperial palace, to the zigzagging staircase in the Riddle Scene, to the surreal garden of blue shadows in which Liú dies and Turandot finds a new life, this production is a pageant of fantasy and art. The main reason to buy this DVD is for the visuals. The cast is decent, but far from outstanding. Eva Marton, in her third filmed outing as the ice-princess, gives an uneven, very “late career” performance: the 51-year-old soprano still offers a sumptuous timbre and raw power, but these are painfully undermined by a squally vibrato and lack of legato. 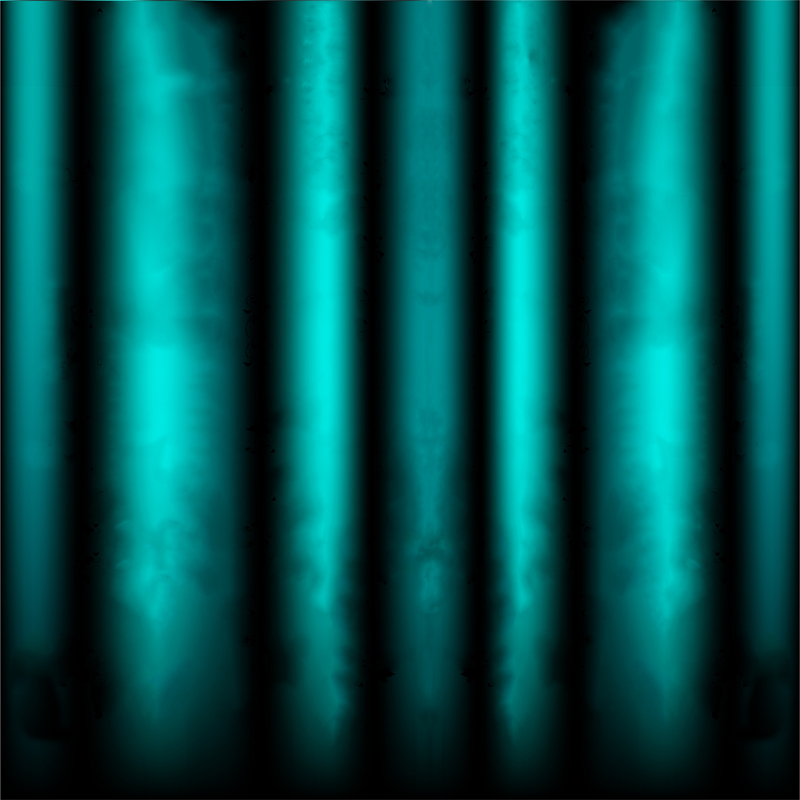 That said, her characterization is better rounded and more deeply felt than possibly ever before. 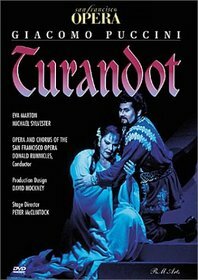 This Turandot is appropriately imposing, but it’s also clear from her facial expressions that she loves Calaf from the start and is torn between that love and her fear of being conquered. Her Calaf, Michael Sylvester, is even more of a mixed blessing. His tenor is warm and sweet but lacks the ideal incisive power, his acting is only adequate, and like Marton, he lacks the physique du role. 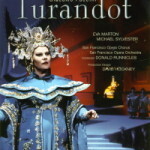 As Liú, Lucia Mazzaria compensates for a lack of both physical and vocal delicacy with a rich Freni-esque tone and impassioned acting. Perhaps the real standout, though, is Kevin Langan’s Timur, sung with gently rumbling gravitas and movingly acted. He and Mazzaria’s Liú have vivid chemistry and his grief at her death is truly heartbreaking. A strong, if cartoonish Ping/Pang/Pong trio (Theodore Baerg, Dennis Peterson and Craig Estep) and a solid supporting cast and chorus make the performance complete. Donald Runnicles occasionally gives us oddly speedy tempos, but for the most part he does justice to the richness and grandeur of the score. Picture, sound and camerawork are all good for their day. 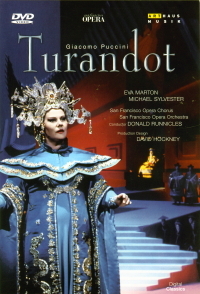 This is an uneven Turandot, no question, but still worth seeing, both for the moments of illumination its performers provide and, most of all, for the colorful, fantastical work of David Hockney. 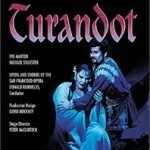 For newcomers I rank it far below Zeffirelli and the Met, but for all Puccini collectors it’s a must. Interesting description of Eva Marton’s voice. Being an opera novice…well, maybe not novice…I am interested to know exactly what squally means. Squally vibrato is a little intriguing. I do love Hockney’s forays into opera so I will definitely want to see this. thank you. I think of squally as a voice that sounds like it could sort of fly off the handle at any moment. Does that make sense? Marton had some great years and some great roles, but her major-house career seemed to end rather abruptly. Not sure I have this exactly right, but there was a big flap over the telecast/video (I think) of the Met’s previous ‘Ring’ production that Behrens “won” and that resulted in Marton leaving the Met in something of a (justifiable?) huff. Always wanted to see a Hockney production live, but wonder if they’d look dated now. Yes, that’s what I meant by “squally”: heavy, shaky and out of control. I’ve heard the story about the “Ring” controversy too. I seem to remember reading that the Met practically promised it to Marton, but then gave it to Behrens instead because she was “a better actress” (and slimmer and hotter). I suppose Hockney’s productions might look dated now, but I still love them! At least this one is still in the repertoire in both San Francisco and San Diego.